Today, 22nd of April is Earth day. To support environmental initiatives, DFGE is happy to extend the fruitful partnership with CDP for the next three years. DFGE has been an official Silver Climate Change Consultancy Partner of CDP since 2014, to support companies responding to CDP. DFGE and CDP have now signed a 3-year partnership contract to extend this collaboration. DFGE believes that CDP is one of the key drivers in climate change reporting, and thinks that the initiative will keep growing as the topic keeps becoming more important for stakeholders. Indeed, climate has been gaining momentum over the past few years, to the point that the UNFCCC countries opted for the Paris Agreement in 2015. To help companies take part in CDP, DFGE supports companies by providing official response checks following CDP methodology. DFGE can help companies formalize an environmental management system and can assess the carbon footprint of any organization. DFGE’s purpose is to support respondent companies in the best possible way. DFGE is also happy to help extend CDP programs, by raising awareness on them and providing technical feedback. In exchange, CDP provides an in-depth training on CDP methodology. DFGE and CDP collaboration also features co-hosting of webinars, participation to events, promotion of partners on communication and more. For instance, DFGE took part to the CDP DACH Spring event. In this sense, DFGE was aware of new methodology changes, could support CDP and could meet CDP respondents. DFGE had the opportunity to take part in a workshop called “Market Place”. The Market place aims at empowering attendants with quick knowledge. There were 4 sessions of 15 minutes, so participants could cover 4 topics among the 12 workshops. 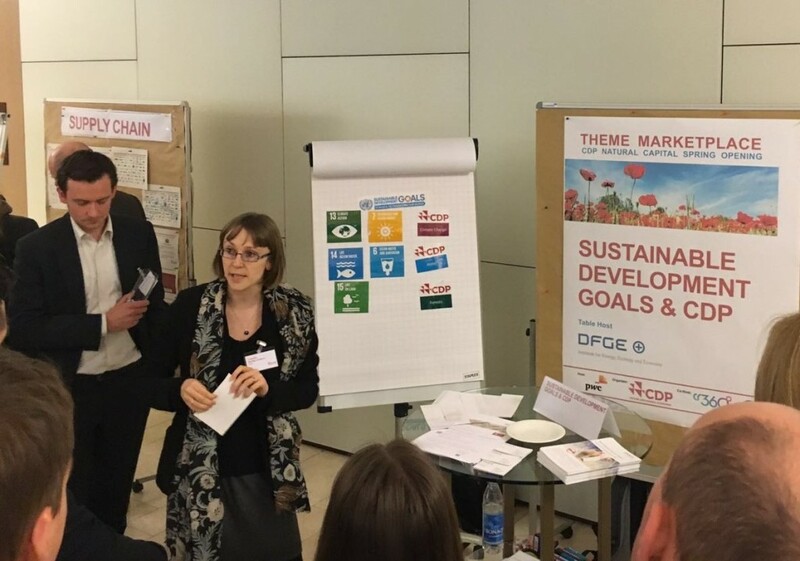 DFGE 15-minute session focuses on the link between CDP and SDGs. By taking part in CDP, organizations already help addressing the SDGs, the new 2030 sustainability agenda powered by the United Nations. DFGE also gave tips and recommendations to companies to tackle such objectives and show how they are already part and parcel of the companies’ sustainability strategies and actions. This entry was posted in Blog, English and tagged carbon, CDP, CDP Silver Climate Change Consultancy Partner, climate change, co2, consultancy, Earth Day, emissions, event, Management, partnership, reporting, spring. Bookmark the permalink.